I am officially starting my five day weekend, and there is no better way than to spend it with good food, family time, and of course, reading. 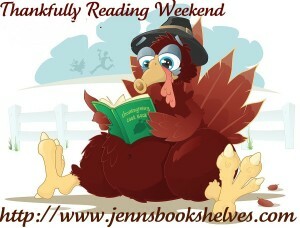 That's why I will be joining in this little readathon hosted by Jenn's Bookshelves: Thankfully Reading Weekend. It will run from Wednesday, November 23 through Sunday, November 27. Here's a little something from Jenn herself regarding the purpose of the weekend . . . There are no rules to the weekend, we’re simply hoping to devote a good amount of time to reading, and perhaps meeting some of our reading challenges and goals for the year. Honestly, I'm looking forward to the long weekend of reading for some self care. My life has been so chaotic and my schedule filled to the brim, but this weekend will be about catching up on some much-needed tasks around the house, spending some good time with family, and then a LOT of reading. It will likely be in that order, so the bulk of my reading will be during the latter half of the weekend. Though I may throw in some good movies that I've been wanting to catch up on! I really prefer to read according to my mood, but I do have a list of books that I want to get through before the end of the year. Therefore, I have made myself a stack of books that I will be pulling from over the next few days. In addition to this stack, I will be listening to an audiobook or two, and finishing up my friend's manuscript. I will posting updates via Twitter and Instagram throughout the weekend, and will share a wrap-up post here early next week. I encourage you to follow along or join in with me! 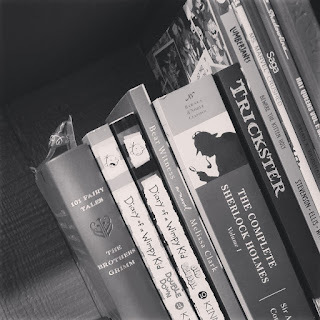 Will you be joining in on the readathon? What are your reading plans for the weekend? I'm joining in this weekend too. I'm aiming to finish all the books I've started but haven't finished yet. Tanya Patrice ... I hope you had a great reading weekend! I didn't get as much read as I had hoped, but it was still a relaxing time!